Conference facility launches comic book - Yellon - Arkitektur, Design och Kommunikation - Jönköping • Malmö • Stockholm • Berlin. Conference facility launches comic book - Yellon - Arkitektur, Design och Kommunikation - Jönköping • Malmö • Stockholm • Berlin. Wanting to do something that no one else in the industry has done is one thing. Daring to do it is another. A good example of the latter is the conference facility Happy Tammsvik, which is launching the first comic book of the conference industry, Harry T. Vik. Idea, creativity and production by the brand experience agency Yellon. 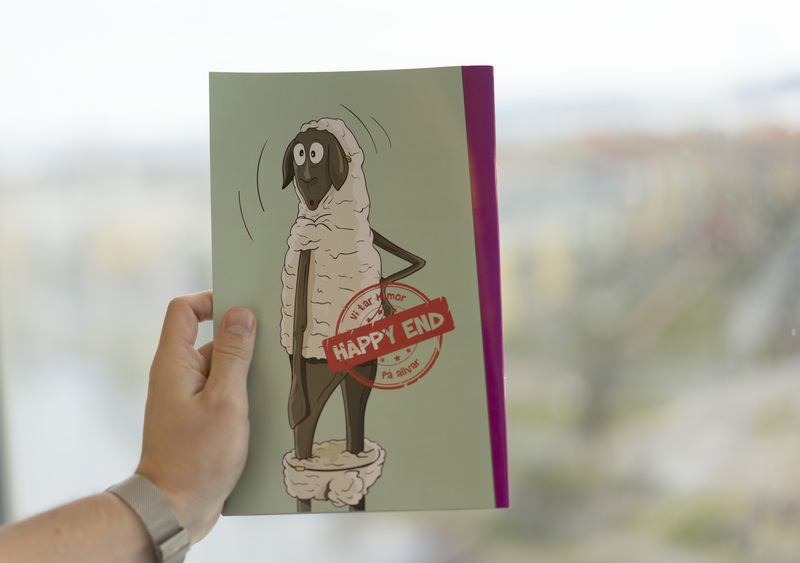 In the comic book, the reader follows Harry T. Vik, the unlucky host at Happy Tammsvik in the pursuit of a star in the White Sheep Guide. It isn’t easy being Harry and he sometimes fails, but somehow he always manages to save the situation. And without revealing too much, Happy Tammsvik promises a happy ending to every story. ‘I have proudly put the comic book next to the annual report in our office. 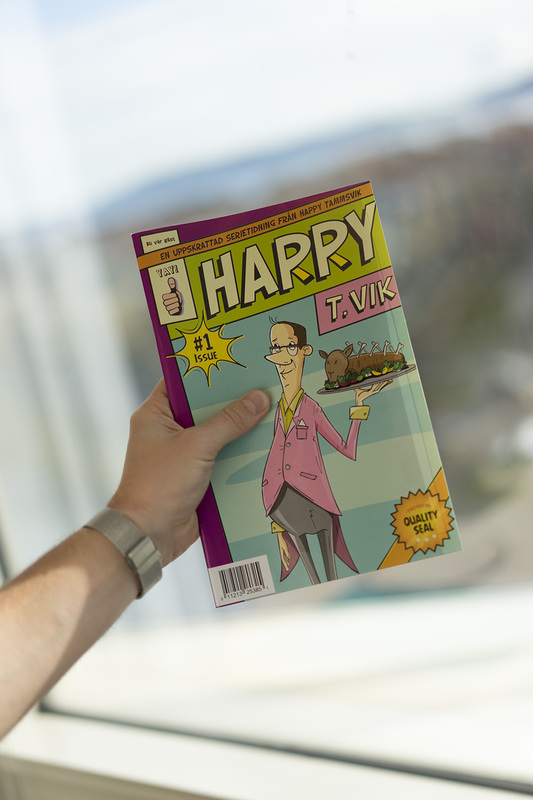 It means a lot to us internally, but above all, the guests who get it in connection with their stay are both surprised and happy,’ says Tanja Askrabic, Marketing Manager at Happy Tammsvik. It’s not just fiction. The environment in which the comic book takes place can be found in reality. In addition to scenes playing out at the conference centre, such as the ball pool, the indoors beach, the bar and obstacle course, Happy Tammsvik’s neighbours, i.e. the horses from Bro Park, pay a visit. And the story line is based on the strengths of the conference centre. From a communications perspective, the comic book is a light-hearted and rewarding media choice for Happy Tammsvik to convey its messages. Self-distance and humour is vital for a conference facility that has claimed the position as Sweden’s funniest meeting place. And whose brand promise is to take humour seriously. ‘What was new to the industry was also something new to us as an agency. 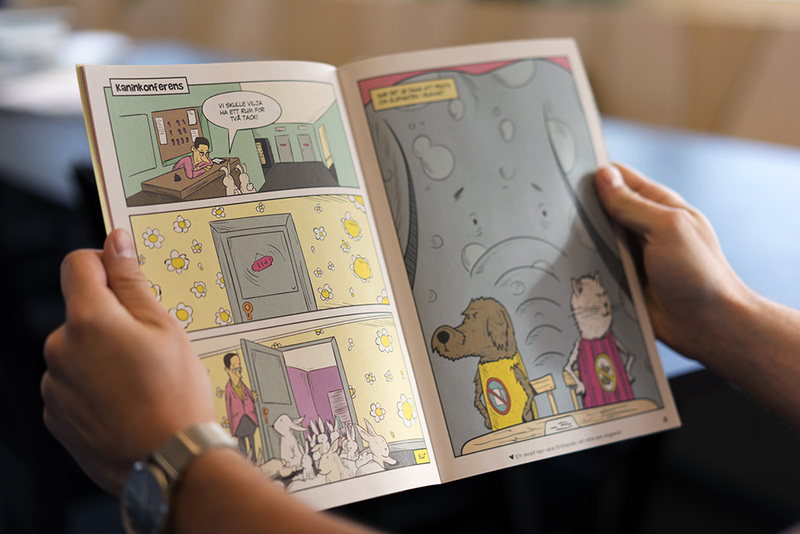 The comic book was a fun challenge and the production involved copywriters, illustrators and graphic designers,’ says Gabriella Fäldt, Customer Manager and Copywriter at Yellon. Happy Tammsvik is Sweden’s funniest conference facility and they take humour seriously. The facility is located in Bro, next to Mälaren and only 40 minutes from Stockholm.